This tool can be used to burn the image files created by the assembler or compiler into the target MCU using some programming hardware. AVRprog is based on a component model. The 'frontend' contains the user interface, the 'backend' contains the drivers for the programming hardware. 'Frontend' and 'backend' are communicating via the backend API. It is further possible to split 'frontend' and 'backend' to different machines using a client/server architecture with the 'netlayer'. A complete package with all neccessary components is available as a module for AVRtoolbox. Implements the user interface. This part can be a simple text based command interpreter or a graphical window with buttons and input fields. The 'frontend' uses the backend API to communicate with the 'backend'. The 'backend' is something like a driver manager. The programmer drivers are part of the 'backend'. The 'backend' is responsible for autodetection of the correct programmer driver and presenting an uniform interface for all drivers to the 'frontend', the backend API. The 'netlayer' is not mandatory! It is an extension of the above construction. It uses a network connection between a client and a server machine (Note: This can be a single machine using network loopback). A daemon running on the server machine uses the 'backend interface' to access the local 'backend'. On the client machine a backend API is provided for the 'frontend'. The 'netlayer' is therefore transparent for the 'frontend'. Use components with matching backend API versions (unless you know what you are doing)! Backend API V0.3 is used. Fuse bit programming is not supported. Backend API V0.3 is provided. For our selfmade Serial1 programmer. Use POSIX termios for port access. For Atmel STK200/300 or compatible programmers like our SerialSTK clone. 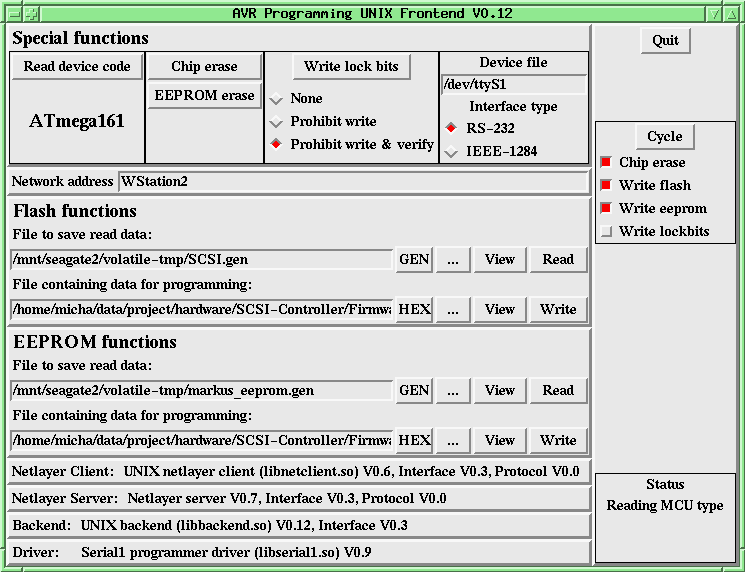 The IRQ is not used, the OS driver for the IEEE-1284 port can be set to polling mode. This driver currently requires GNU/Linux 2.2 or later. Use ppdev kernel driver for port access. Data polling is supported for Flash-EPROM and EEPROM. For serial and parallel programmers that use the protocol of the serial one described in Atmel Application Note AVR910. For AE-AVR PRG programmer from Akizuki Denshi. For STK500 evaluation board from Atmel. 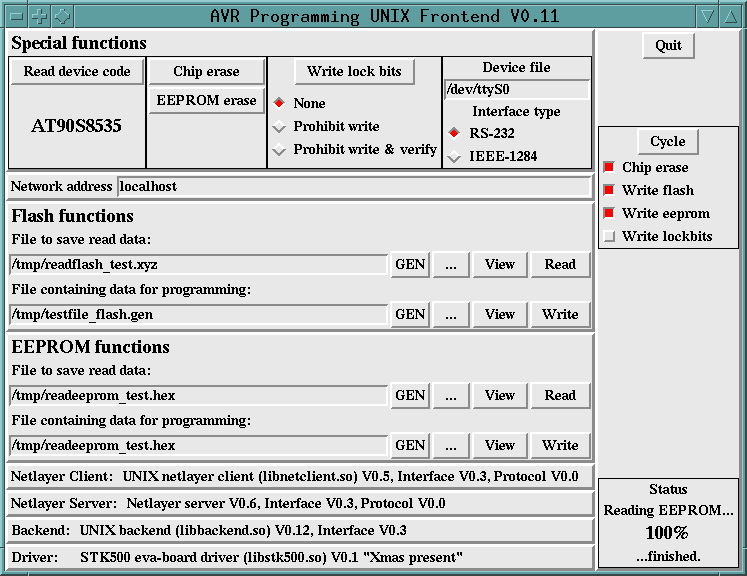 For selfprogramming capable AVR devices with bootloader using the protocol described in Atmel Application Note AVR109. Supports fusebit programming and oscillator calibration. Backend API V0.4 is provided. All drivers now use driver API V0.1. This driver is only available for GNU/Linux and NetBSD. For port access parport/ppdev is used on GNU/Linux and ppbus/ppui on NetBSD. Supports STK500 running V1.x firware. Use FOSSIL for port access. If you want/need support for other programmer and/or MCU types, contact us. Network protocol V0.0 is used. WATTCP is used for network access. Check the AVRprog changelog to get information which version of AVRprog provide which features.